Costco is one of the largest pizza retailers in the country. A slice costs $US1.99, and a full pizza costs $US9.95. It’s a decent pizza considering the context – and the deal alone makes it more than worth it. 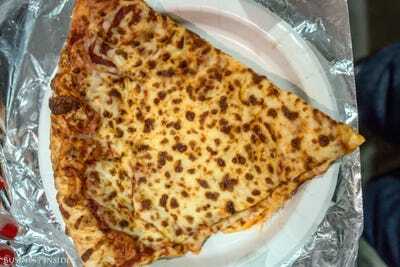 Costco is one of the largest pizza chains in the US. 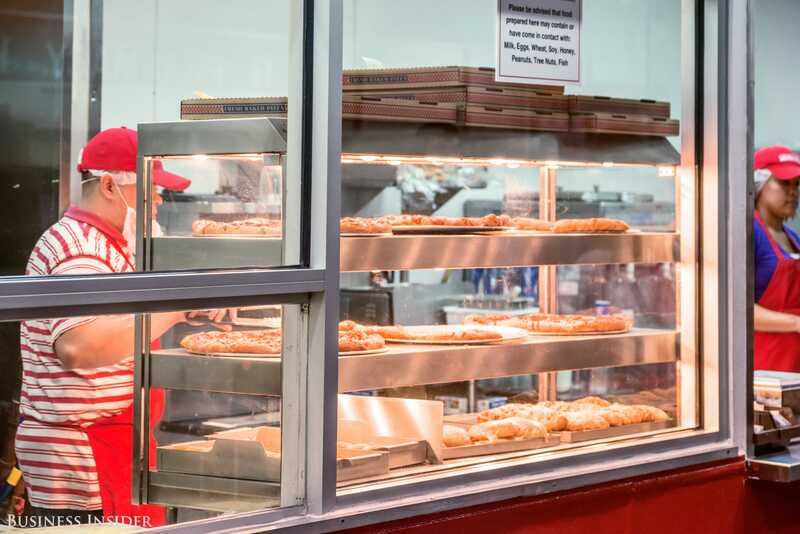 Yup, you read that right – with over 700 locations and, therefore, food courts, Costco is considered the 14th largest pizza chain in the country. It’s technically bigger than California Pizza Kitchen and nearly as large as CiCi’s. That’s an impressive feat for a retailer that also sells coffins, cars, safari vacation packages, and gallon jugs of peanut butter all under the same roof. With that in mind, we decided to head over to the nearest Costco to see just how good the pizza is – is it really worth the visit? Costco is a veritable land of plenty — and its food court reflects that. 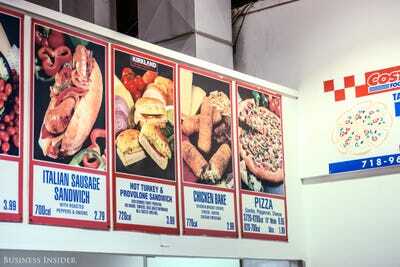 While its faded signs and dated ’80s food photography aren’t much to look at, it may end up being one of the best lunch deals around. It serves a strangely wide selection of food, from barbecue pork sandwiches to smoothies. In 2011, the chain sold 100 million hot dogs – four times as many sold by the entirety of Major Baseball League stadiums that year. But we’re here for the pizza. The price point, like the rest of the menu, is extremely attractive: $US1.99 for a slice, and a bargain-basement $US9.95 for an 18″ wide pizza. That’s … insane. 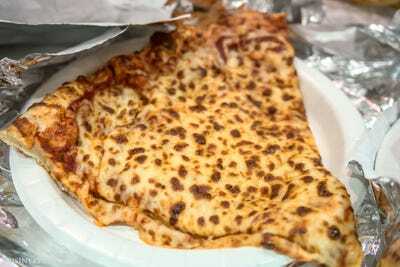 There are three pizza types to choose from: cheese, pepperoni, or “combo,” which is essentially a supreme pizza. Whether you buy it by the slice or by the pie, the process is incredibly quick. 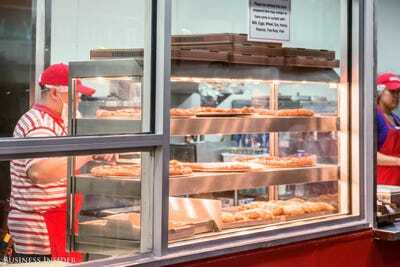 Obviously, the chain has slices ready and waiting under heat lamps, and the baking process is streamlined so that the wait is minimal for a freshly baked pizza. Plus, Costco members can call ahead and place an order to pick up. But the question remains: how is the pizza? First of all, the slices are enormous. Gargantuan. They fill up an entire normal-sized paper plate – they practically have their own zip code. If anything, they’re unwieldy because of the size. The size also plays into the floppiness of the slice – there’s no way something that wide and flat can be structurally sound, no matter how crispy the crust is. And we’re not saying it’s crispy; it’s rather doughy, although it’s important to note that it’s not soggy. It’s just a more flexible, chewy crust. The cheese is fairly standard — melty, greasy, lightly burned on top to give it that familiar dappled look. The tomato sauce has a light sweetness to it, but not enough so it’s strange. Plus, there’s more cheese than tomato on this slice anyway — lactose intolerants, beware. It’s fairly close to Pizza Hut’s cheese pizza in terms of taste, which is a welcome surprise considering Pizza Hut’s pizza won our cheese taste test out of the three major delivery chains. It’s salty, greasy, and a tad chewy – but those are three qualities that makes cheap pizza taste so good. And for $US1.99 per slice – essentially two regular slices at this size – it’s an amazing deal for a hungry family of Costco shoppers. Then again, you don’t even have to be a member to buy the food if you can get in. So get eating.